Sheffield Print Fair: Sheffield Print Fair 2018 - Call for artists! 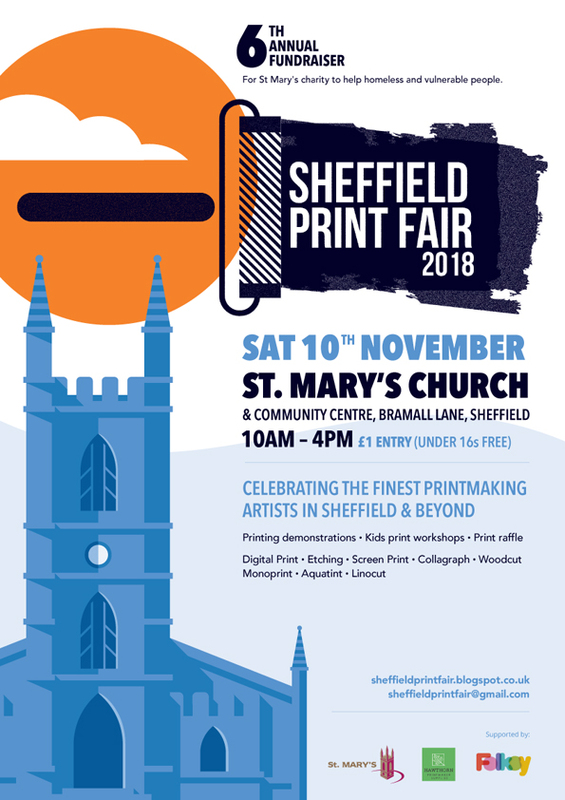 Sheffield Print Fair 2018 - Call for artists! We are proud to launch the 6th annual 'Sheffield Print Fair', which will take place on Saturday 10th November 2018, at St Mary's Church & Community Centre, Bramall Lane, Sheffield. The event will run from 10am until 4pm, and will feature printmaker stalls as well as print demonstrations and kids print workshops throughout the day. This year, we will also be introducing a print raffle too! The event is a fundraiser for St Mary's and their projects helping homeless people and refugees. We are being supported by online craft-selling hosts Folksy, and Hawthorn Printmaker Supplies, who will be at the fair with their presses and other printmaking goodies. We are offering 44 stalls at the event for artists/printmakers. We are now looking for applicants for the event, printmakers from Sheffield and beyond; woodcut, mezzotint, linocut, screen-print, wood-engravings, digital prints, monoprints and more! We are also for people who are interested in doing a demonstration of their print technique (to whom we will offer a free table). *Please note - We can't accept prints that are simply reproductions/scans of artworks created in other media. The application deadline is 3rd September 2018, and we will inform all applicants of the result by 10th September 2018. Stalls are £65 each (a 6ftx2ft table), or £32.50 for a half-table. There is space behind each table for a display board if you wanted to bring one, and some room by the side for small print browsers. Please read the 'Information Sheet' before completing the Application Form, and send your completed forms to sheffieldprintfair@gmail.com, and remember that we cannot consider applications if they are not accompanied by images of your work.